INSPIRATION is one of the themes in my poetry work. I draw inspiration from different people, surroundings and aspects of life which speaks truth to my poetry. In addition, some of my pieces set out to inspire readers to strive to the best of their capabilities. The story that I am about to share with you is about my 10 year old niece who is a huge inspiration to many people, including myself. She makes me so proud. Tupou Neiufi is a Tongan student at Sutton Park Primary School in Mangere, South Auckland, New Zealand. She is partially physically disabled due to a hit-and-run accident back in 2004 when she was at the age of 2 years. It was a traumatic event. Doctors had ruled out the possibility of Tupou being able to walk again. Over the years, I have seen Tupou’s parents, Rose (aka Lose) and Fineasi Neiufi, work considerably hard to support Tupou’s physio therapy treatments and her personal growth. It has been an emotional journey for Tupou’s parents but just like other parents, they want what is best for their child. Over time, Tupou was able to walk again despite the medical opinions that had suggested otherwise. Watching Tupou walk was a huge progress and so Rose and Fineasi decided to enrol Tupou into a swimming programme to assist with Tupou’s physical growth and development. On Saturday 5th November 2011, the Paralympics New Zealand Nationals in swimming took place in Hamilton, New Zealand. I had the pleasure in travelling to Hamilton with Tupou and her parents to support Tupou as she was one of the swimming competitors to represent Auckland. It was a truly inspiring day! Rose, Fineasi and I had watched all the competitors and especially Tupou strive at their best. Tupou competed against National representatives and champions. The disabilities were prevalent amongst the competitors but they each had a positive spirit and they were adamant in putting forth their best. Rose, Fineasi and I went teary eyed as the competition advanced and we were ecstatic for the winners during the awards ceremony. 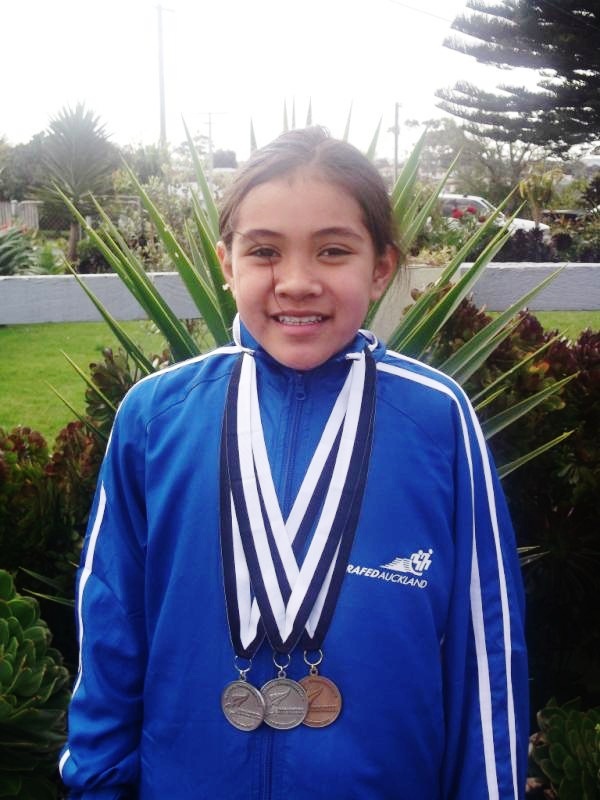 At this competition for Paralympics Nationals New Zealand in swimming, 10 year old Tupou won 1 GOLD and 2 SILVER medals which is a huge accomplishment. This day was a day of victory for Tupou and her parents considering all the challenges that they have faced. An update of Tupou’s progress will be made in June 2012. I believe in nurturing the younger generation and in particular our own family members. As adults, we are the first teachers and first role models for our younger family members and we must take responsbility for their well-being, their growth and their future. 10 year old Tupou continues to demonstrate that despite her disability, she can still work hard and thrive in school and in her sport. I admire Tupou and her parents, Rose and Fineasi, for their inner strength, their ability to rise above obstacles and their faith in God. Tupou’s zest for life is apparent and she is an inspiration indeed! Thank you Donny for your kind words & thank you Meli for sharing Tupou’s story. We hope that it inspires people young and old to not give up hope, but keep striving towards their goals and dreams, because we believe that nothing is impossible, ofa atu. Congratulations Tupou! Thank you for sharing er story with us Maryanne! She is a beautiful child, inside and out..thanks for telling her story. This is no less than a wonderful story, and very inspiring! God bless to you, Tupou and to you, Maryanne for sharing this…Thank you! Lovely! Thank you for sharing… Miracles and wonder do exist all around us! This is awesome! Thanks again for the nomination for Versatile Blogger. I wanted to let you know I nominated you for the Cute Blog award. So inspiring! Well Done Tupou! Please help us to follow wonderful Tupou’s story if u can. Thanks for sharing. What an inspiring little girl, bless her heart. I needed this today. I just found out that a friend of mine had to have both legs and her fingers amputated, as well as lost the baby she was carrying. This reminds me that there is always hope and not to let anything get in our way. Thank you. It’s so sad to hear about your friend’s situation. She must be going through a lot right now. I’m so glad that she has you as a friend to help her through this life changing experience. The key is to have many positive supporters around her so that she doesn’t feel like she’s experiencing it on her own. Some of the competitors at this NZ Paralymics in Swimming that Tupou had competed in had missing limbs and they were either born without a leg(s), foot(feet), arm(s), hand(s), finger(s) or they had it (them) amputated. Other competitors were blind and/or deaf. It was deeply humbling and heartwarming to see each of the competitors give it their all and the wonderful thing about it is that the families and friends of each competitor were there to show their support from the side line. Families and friends cheered the competitors on and celebrated not only their achievements but moreso their participation in the competition. I couldn’t help but go teary eyed from the side line. Continue to be there for your friend. She will need you and her family to be there for moral and emotional support. Aww – I am a total sucker for happy ending. What an amazing family. Their smiles & spirit give away nothing about what happened. Congratulations again Tupou. To Lose and Fineasi, I take my hat off to you both – that must have been hell to go through, and yet you obviously trusted that it was not God’s plan for her not to walk. After going through something so horrific, it would be tempting to bubble wrap your child to keep them safe. You opted instead to wrap her up in love, support and encouragment and look at the results. What an exciting future in sports – I look forward to hearing more about your progress Tupou. Thanks for reading through this piece sis and also thank you for supporting Tupou in her efforts to compete in the Nationals last year. Rose has mentioned that she and Tupou will read through all the comments and they will respond to all the words of encouragement and support. Hi everyone I’m Tupou’s mum Rose, thank you all so much for your kind and heart warming words. As I read each of your comments, I could feel my eyes were starting to fill up with tears of happiness. Tupou has taught me to be grateful for all the little things in life, and to never take anything for granted. She has taught me that when all things go down hill to pick yourself up and keeping trying because nothing is impossible. I’m glad to hear that you have each found a bit of inspiration from Tupou. Thank you all again for taking the time to read about Tupou’s story, and thank you Maryanne for sharing it on your blog, Tupou will read through your comments and respond tomorrow since it will be a holiday here, god bless and ofa atu. Hi everyone, sorry for the late comment, I have been real busy with my homework and training for my next competition, but I would like to thank everyone for your comments. Thankful to god for blessing me with this talent and for guiding me in the right path, I feel very happy reading all the comments. Your comments have made me even more confident that nothing is impossible, you just have to keep trying, and that’s what I’m going to do is just keep trying till I reach my goals and dreams. Thank you aunty Meli for sharing my story, I hope it encourages other children with a disability to keep going and don’t give up. Thank you again eveyone and may god bless you all.